Shagaf Takes Gotham Stakes in Stride: The Gotham Stakes was not only a test for the battle tested Sunny Ridge, who finished 4th, but also a learning experience for many others in the field. The second place horse, Laoban, is still a maiden, even after a tough effort in the 1 1/16 mile contest. Trainer Eric Guillot said of Laoban, “He’s got tons of ability but this horse, when you ride him, he gets on the muscle and just keeps peddling.” However, he was not enough to hold off his fellow competitor, Shagaf. Shadwell Stable’s highly regarded homebred Shagaf lived up to his lofty expectations to take the 64th running of the Grade 3, $400,000 Gotham by 1 ¼ lengths Saturday afternoon at Aqueduct Racetrack, earning 50 points to virtually lock down a spot in the Kentucky Derby on May 7. Shagaf came into the race on a win streak, hoping to extend his streak to three wins in as many starts. Trainer Chad Brown was necessarily expecting his colt to win, but to learn something and potentially learn something in the process. Shagaf is bred to be able to handle distance but would likely be best suited for nine furlongs, but he could be effective at ten furlongs. With his win in the Gotham, he likely has earned a spot in Louisville. However, looking at his pedigree, it possibly may be suspect if he will be highly effective on Derby Day. He is sired by 2006 Champion 3-Year-Old colt, Bernardini, who went nearly undefeated in his only season at the track. He finished 4th in his maiden voyage and 2nd in his final start, the Breeders’ Cup Classic, behind Invasor. Bernardini won races of great importance, including the Preakness, the Travers, and the Jockey Club Gold Cup, among others. 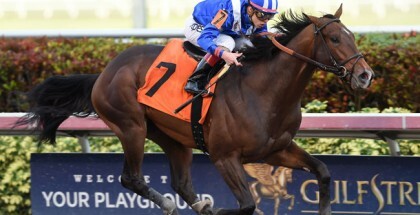 Bernardini has not been a huge success at stud, however. He does stand for a 2016 advertised fee of $100,000. He has colts and fillies who have achieved much in their careers, including Zulu and Lewis Bay, of who are on the Derby and Oaks trails. Bernardini has also sired horses like Stay Thirsty, Imperative, To Honor and Serve, Dame Dorothy, and Cavorting. Shagaf’s dam, Muhaawara, was a minor stakes winner in her time, but Shagaf is her only foal of three to make it to the track thus far. He is ½ to Gharbeya, a More Than Ready filly that is owned by Darley. There is also a two-year-old named Mahasen, a Tapit filly. Unbridled’s Song is the broodmare sire of Shagaf. Unbridled’s Song was not only a successful racehorse, where he won the 1995 Breeders’ Cup Juvenile over top racehorses Hennessy, Editor’s Note, and Honour and Glory. 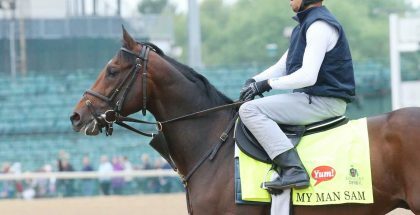 The following year, he won the Florida Derby before finishing 5th in the Kentucky Derby. He retired after a short 1997 season and stood his entire stud career at Taylor Made where, as of 2013, at the time of his death, he had sired 730 winners in just over 1,000 starters lifetime. His lifetime progeny earned just over $90 million, as of 2013. Shagaf had to grind out his win in the Gotham Stakes and looks like a horse that is still learning but is on the right track to be a top competitor. 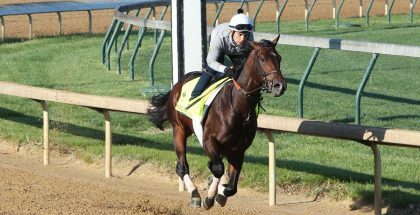 He is likely to have one more start, in the Wood Memorial, before the Kentucky Derby. Shagaf, if he wins the Wood Memorial, and Mohaymen wins the Florida Derby, Shadwell would have two horses going into the Kentucky Derby, undefeated.